Author, speaker, athlete, engineer, humanitarian. 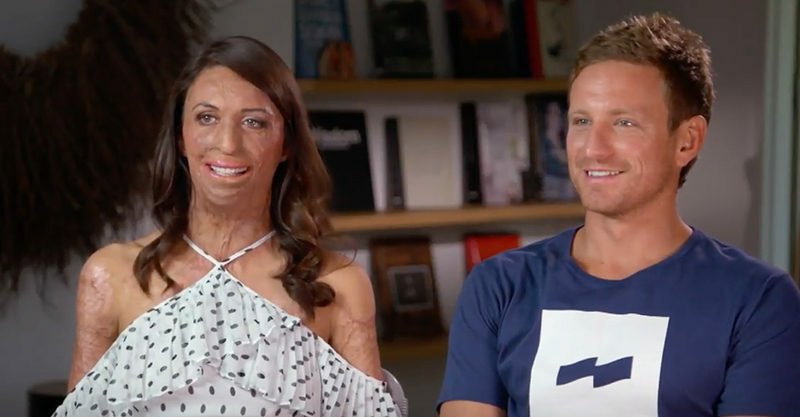 These are just a few of Turia Pitt’s impressive accomplishments. Now she’s adding ‘mother’ to the list! She confirmed her – and fiancé Michael Hoskin’s – exciting baby news in an interview with 60 Minutes last night. “Do I just say I’m pregnant? !” Turia asks 60 Minutes interviewer Allison Langdon, breaking the news to the rest of Australia, who are of course delighted. The couple – who got engaged in 2015 – are pretty over the moon too. “What was your reaction when that first test came back as positive?” Allison asks. Turia said this new development has enriched the couple’s already pretty lovely life together. “You feel a bit different. You’ve got a responsibility now,” Michael confirms. “And I feel the same with Michael. I find it really, like, attractive,” Turia laughs. “I know 100 percent Michael’s going to be an amazing dad, because he had to look after me for years and he was so patient, so caring. I think those qualities, especially in a parent, are really desirable,” she says. After feeling a bit tired and squeamish a test revealed that a baby was indeed on the way. It was just days before she and Michael were due to set off on a trek to Mount Everest, raising funds for healthcare nonprofit Interplast and something had to give. The gruelling conditions of the trek ahead meant the mum-to-be had to withdraw from the walk. “I wanted to do the walk, and then I thought about it and you know it’s not just myself I have to think about and Everest Base Camp there’s high altitude, low oxygen, not much sanitation and if something happens to you it’s really hard to get to a medical facility,” Turia said. She’s previously walked the Kokoda Track, recovered from life-threatening burns she suffered in the Kimberly Ultra Marathon and leapt tall buildings in a single bound, as you probably know.